What is SPRIX® Nasal Spray? SPRIX® Nasal Spray is the first and only NSAID (Nonsteroidal Anti-inflammatory Drug) nasal spray that contains the potent pain reliever, ketorolac. Since 2010, SPRIX® Nasal Spray has been approved for the short-term treatment of moderate to moderately severe pain for up to 5 days in adult patients who require opioid-strength pain relief. is SPRIX an opioid medication or a controlled substance? 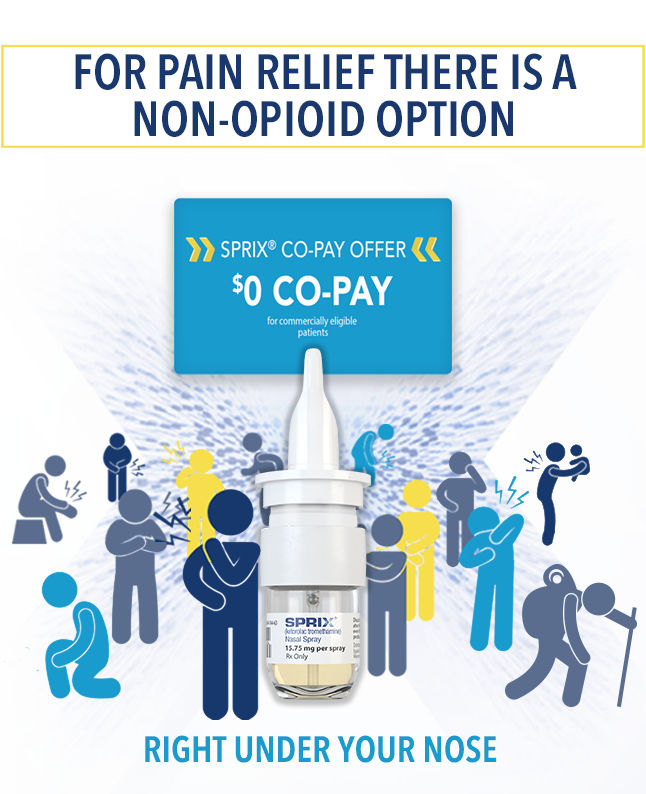 No, SPRIX is the first and only intranasal NSAID that provides pain relief at the opioid level. How do I get SPRIX? Ask your doctor if SPRIX is right for you. When you are prescribed SPRIX, your doctor will also enroll you in the SPRIX Direct program, which conveniently delivers the medication to your home, along with instructions for how to use it.